Home is where we enact our rituals of comfort, safety, and happiness, so it is fertile ground for artistic intervention. 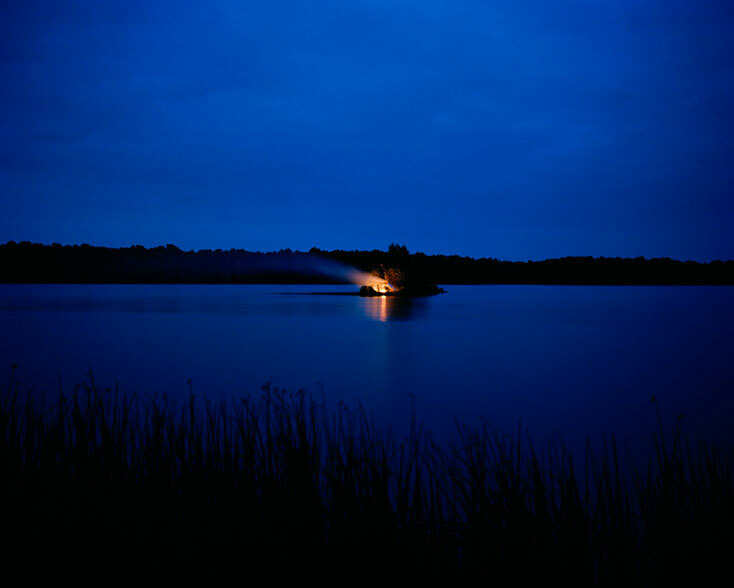 For Burning House, her second solo exhibition at Monique Meloche Gallery, Carrie Schneider ritualistically immolated 15 house-structures on a remote island in a Midwestern pond, and she presents the documentation in one photograph per house as well as a compilation video. Schneider built and burned the homes over a span of more than two years, from September 2009 to November 2011. In the photographs, the surrounding landscape performs its own quiet drama of seasonal and diurnal effects, as sunsets accept the smoke and rains mute the blaze. The world tends to go on. Burning House contains all the trappings of a good, potent myth. Schneider journeyed to Wisconsin from Brooklyn to light these small fires. She built the eight-by-six-foot houses and ferried them individually to the island in a rowboat. She tested the disposition of fire against various atmospheric conditions. One phthalo-blue twilight (September, nightfall, 2010) is saturated with impossibly luminous energy; the night scenes flash like warnings; and sometimes the smoke trail is black as defeat. In each sacrificial offering, the house effigy was released of its archetypal form and significance, only to be restored when Schneider returned to Wisconsin to build a new house. Schneider’s repetitions are not the enactment of a self-destructive compulsion. Rather, she has invented a new ritual of self-habituation. Her photographs assert that a house is a persistent archetype whose form—a rectangle topped by a triangle—is overcrowded by normative domestic values crammed into the most personal place of all. Sometimes it cries for release. Schneider proposes that, as you leave old homes to memory and practice future ones, you create the most intense housewarming possible.